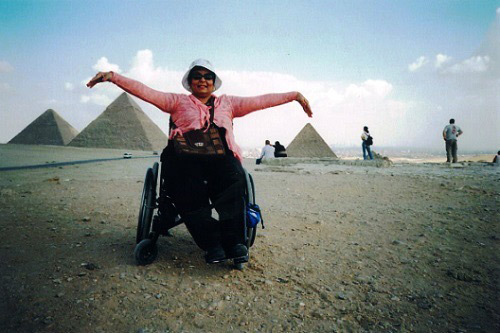 I’m Tabassum and I’ve been to some cool places in my wheelchair. This chair has even seen the pyramids! At first, it might seem intimidating for people with disabilities to travel to foreign countries: sometimes the climate or the infrastructure makes it difficult to get around and navigating language barriers and cultural differences can be challenging. I’d like to show you it can be done, if you keep a few points in mind. When I travelled to Egypt, it was dry, hot and sandy. I managed just fine thanks to my excellent Egyptian tour guide. I tipped him generously at the end of every day. He ended up finding a helper to carry my chair through uneven stairs or difficult passages. I wouldn’t have seen such out-of-the way places or views without his help. Remember to always show locals and service-providers respect, kindness and generosity in a foreign country. Remember that the CAD and USA dollars are much higher in value than their local currency. In Pakistan there are very few services for special needs travellers or people with mobility issues, but Pakistanis are very compassionate people. Locals in developing nations will appreciate a kind gesture, and in most cases, help in every way they can. When I was in Karachi, I had to take a taxi to the shopping mall. The driver folded my chair but it took him a second to figure out where to put it. He tied it with a rope on top of the taxi so it wouldn’t fly off as we drove away. It’s a good thing too, because he drove like a mad man! I was clutching my tummy and hanging on to my seat- I was so afraid. I’m used to driving myself in Canada, but we don’t drive like that here! 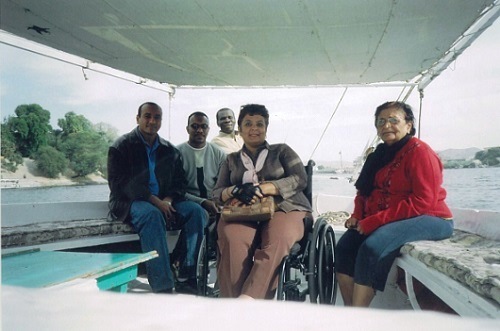 In Egypt I was very excited to take a Nile River Cruise, but when I arrived at the port, I saw how was difficult it would be to board the ship. The cruise ship was triple docked: to get to our boat the passengers had to walk up a very narrow gang plank and walk across the first, then the second ship. Instead of giving up and turning around when I saw this, I had three people lift me up and along each boat yelling “make way for Cleopatra!”! I loved every second of it. When he saw how much I wanted to go, he agreed with a chuckle. I was fine paying extra to make that happen. In the end, the people you meet on your trip help you make it work. Be willing and able to spend money on your trip: always budget more than you think. 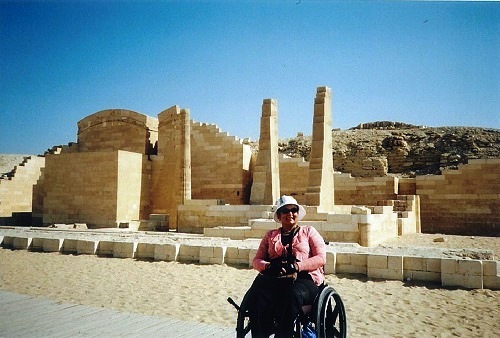 Travellers with disabilities can’t always travel on a budget! “Roll” with it, and you’ll have a great time!